CHICAGO - Take Your Dog To Work Day isn't until June 26. Diesel, an 8-year-old schnoodle, looks at the calendar and snorts. Diesel comes to work one or two times a week at Kaleidoscope, a company that assists brand owners through consulting, strategic design and prototyping, in Chicago. On this particular afternoon, she is walking the aisles near the workspace of her person, Dawn Brigando. "We come in and she's on her own," says Brigando, a production artist. "I never worry. She knows who she gets treats from, and she's free to go where she wants." Diesel, who has been coming to the office since she was about 4 months old, is part of the culture at Kaleidoscope, which has an open doggy door policy. Employees are encouraged to bring their canines to work, and eight or 10 of them do regularly. There's usually a dog (or dogs) in the office three or four days a week. The idea of pets in the office isn't new. But it got a boost when Pet Sitters International launched Take Your Dog To Work Day 17 (people) years ago, and things have snowballed. According to the American Pet Products Association, 20 percent of U.S. companies now have adopted pet-friendly policies. "I don't know the origin of this. I do know it's a growing trend," says Steve Feldman, executive director of the Human-Animal Bond Research Initiative Foundation, a nonprofit research and education organization based in Washington D.C. that gathers, funds and shares research on the positive health impact of animals on people. "Fortune magazine, which is known for its annual list of best places to work, now also puts out a list of the most pet-friendly companies," Feldman says. "Having dogs in the office is nice," says Kaleidoscope CEO Gary Chiappetta. "It calms things down, makes people happy." Lying next to his desk is Olive, his 3-year-old Australian labradoodle. "Pets have a wonderful effect on people," Feldman agrees. "They reduce stress, lower blood pressure, and they increase social interaction, in and out of the workplace." At Kaleidoscope, the rules are unwritten. Actually, there really aren't any. "People are very respectful (of co-workers) and want to keep this up," Chiappetta says. "Only one time did we have somebody's dog that was a distraction. You tell them, 'If the dog needs that much attention ...'"
At some businesses, animals aren't so much invited as they are interlopers. At Sharprint, a Chicago apparel printing and embroidery company, a young orange cat wandered into the building through an open door one night in November 2013. An employee coming to work the next morning found her sound asleep on a pile of T-shirts. She was dubbed Molly at first, but employees soon started calling her Margaret Schroeder, after the character from "Boardwalk Empire," and she became the company's house cat. Or a member of the staff, depending on your outlook. "She caught a mouse once, so she at least earned her keep," says Zach Corn, Sharprintas head of sales. He says Margaret -- or Schroeder, she doesnat have a preference -- spends most of her time lounging. "She's a stress reliever," Corn says. Of course, having dogs or cats as daily visitors to the office isn't practical for all companies. Adam Goldberg, digital marketing specialist for the Humane Society of Broward County in Florida, came up with an alternative, the Snuggle Delivery. For $150, HSBC volunteers will bring puppies, kittens, dogs or cats to your office for an hour of playtime. 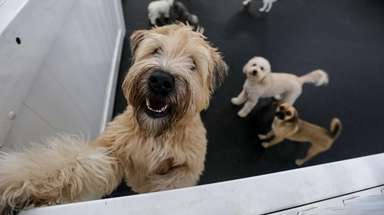 Employees get a treat, homeless animals get needed socialization, the shelters raise money and get the word out about their mission, and when things click, there are adoptions. Goldberg got the idea from a Texas group that brought kittens to a workplace. "I said we could totally do this. ... We had no idea it would be so successful." In the first two months, there were four adoption events and another dozen are on the schedule. Eight puppies found homes in those first four events. In addition, the group raised more than $2,700. "The fee is only $150. People are donating above and beyond, and in addition are donating items off our wish list," Goldberg says. The program got off the ground about three months ago. "When we first did it, right before tax time, the people who jumped on it were accounting firms," Goldberg says. "They were very excited because they were very stressed out." "It's a good trend," Feldman says. "It makes us happier, healthier and makes us more satisfied with our jobs." 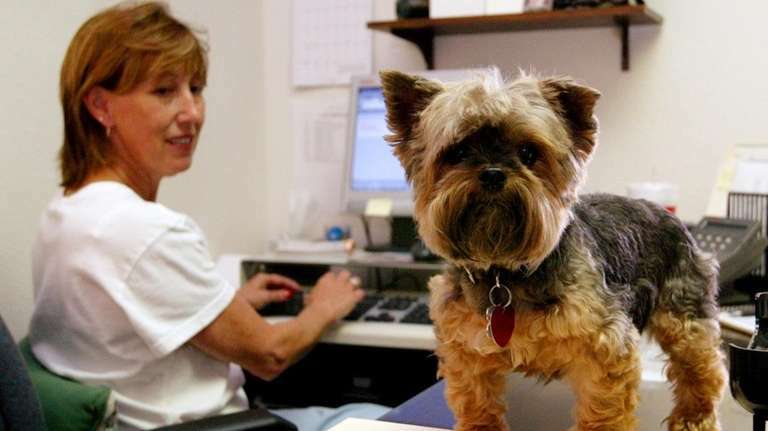 The 17th Take Your Dog To Work Day is June 26. Pet Sitters International, which created the event, invites businesses to download its free Action Pack planning guide on its website: takeyourdog.com. - Do an office check. Check with management and co-workers to see if anyone is allergic, afraid of or opposed to you bringing your dog to work. Be respectful of those you work with and plan an alternate celebration, if necessary. - Puppy-proof your work space. If you plan on working with your dog, make sure your office environment is safe. Remove poisonous plants (go to aspca.org for a list of toxic plants), hide electrical cords and wires, and secure toxic items such as correction fluid and permanent markers. If your office has received any pest control/extermination services, ensure there are no hazardous products accessible by your dog. - Is Fido fit for work? Be sure your dog's shots are current. Also, make plans to have him bathed and groomed. Be mindful of your dog's "work-readiness." If he is aggressive or overly shy, it's best to leave him at home. - Prepare a doggie bag. Include food, treats, bowls, toys, leash, paper towels, clean-up bags and pet-safe disinfectant. If you are routinely in and out of your work space, consider bringing a baby gate or portable kennel. - Plan his feeding and, um, his business. Plan your dog's feeding time and subsequent potty break around your work schedule. Choose an appropriate area for your dog to relieve himself. - Don't force co-workers to interact with your dog. Be mindful of fellow employees' time and space. Dog lovers will make themselves known. - Keep tabs on the treats. To avoid pet accidents, monitor the treats your pet is given from co-workers. Remember that chocolate, candy and other people food should not be shared with dogs. Some non-dog owners won't know that these items can be toxic to pets.